KEA’s 4000 Series is most suitable for highly explosive, reactive dust (aluminum and titanium), and oil mist applications. 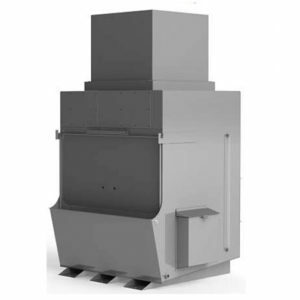 This unit efficiently passes the incoming dust laden air stream through a water vortex which separates the dust particles into the sludge basin. *Please contact us directly for ordering. INCLUDES: An industrial quality 3-HP TEFC motor, spark proof cast aluminum housing and radial fan wheel, 12-gauge carbon steel cabinet with motor compartment & sound absorbing material, airfoil baffles, special mist eliminator filter, 1” drain valve, water level control system, sludge rake, and one 6” air intake inlet. Sherwin Williams Gray Epoxy finish. 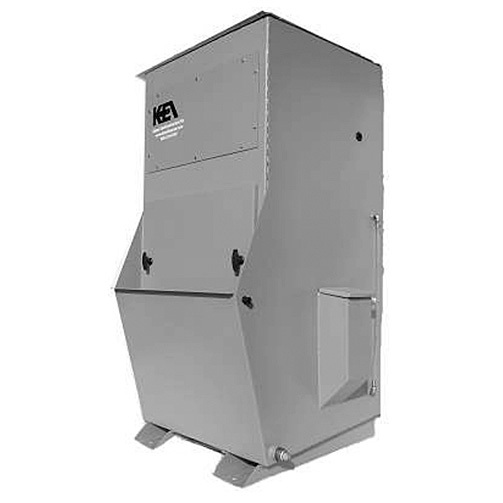 This unit filters the air by a combination of centrifugal force and violent inter-mixing of water and contaminated air. As the air stream passes the fixed baffles, particulate is separated by a heavy, turbulent curtain of water created by high velocity air. The centrifugal force caused by the rapid changes in air flow direction forces the dust particles to penetrate the water droplets and become entrapped within the droplets. Contaminated water is then removed from the airstream by special mist eliminator filter. Dust settles to the bottom of the unit as sludge and the water is recirculated. The basin is periodically manually cleaned via the angled front access using the included sludge rake.